The Alchemy-Spetec Drill Pump is a high pressure, single-component chemical injection pump suitable for low to mid viscosity chemical injection grouts. It’s most commonly used for the application of polyurethane injection grouts. 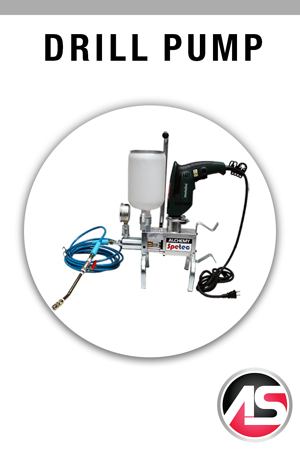 The drill-mounted design offers a convenient and portable solution for chemical injection applications. The Drill Pump offers an unmatched ease of access to the piston assembly and ball/springs through just a few allen screws. The small reservoir and direct-feed design allows for small batch mixing and eliminates excessive losses due to mixing and priming. The portable design (20lbs with drill) provides a unique and high pressure solution that can easily be carried onto swing stages, scaffolding or scissor lifts. Click here to download the Drill Pump datasheet for more info.